23 January – The Department of Environment (DoE), partnering with the Reef Environmental Education Foundation (R.E.E.F. ), has resumed its annual ‘Grouper Moon’ research project in the Cayman Islands and work on that project will continue into next month. The project, which started in the mid-1980’s and dubbed ‘Grouper Moon’ when the REEF partnership began in 2002, has taken on a special significance this year with the recent change in designation of the Nassau grouper from endangered to critically endangered species by the International Union for Conservation of Nature (IUCN). ‘Critically endangered’ is the strongest warning the IUCN can issue, indicating that a species is facing an extremely high risk of extinction in the wild. Based on its research, the IUCN believes the Nassau grouper population has declined globally by more than 80 per cent since 1980. Despite the IUCN critically endangered species designation, DoE and REEF research conducted in the Cayman Islands over the past decade has shown a noticeable resurgence in the Sister Islands’ Nassau grouper population, particularly off the coast of Little Cayman, where one spawning site (often referred to as a spawning aggregation) monitored by scientists saw more than 6,500 grouper return in January/February 2018. The same site recorded fewer than 2,000 grouper a decade ago. 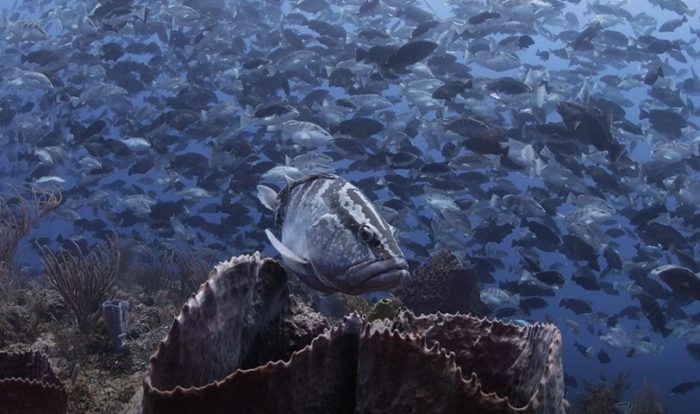 A separate spawning site off Cayman Brac counted nearly 1,000 grouper last year after earlier counts came in at roughly half that number. The current closed season for Nassau grouper in Cayman Islands waters began 1 December, 2018 and will last until 30 April, 2019. During the closed season anyone who takes, purchases, receives, offers for sale, exchanges or donates Nassau grouper commits an offence under the NCL. In addition, anyone who possesses or permits another person to take Nassau grouper (Epinephelus striatus) from Cayman waters during the closed season commits an offence. Fishermen who inadvertently catch Nassau grouper during closed season should release them alive, even if the grouper is hurt during the catch. Using circle hooks, as opposed to J-hooks, can make the process of removing the hook from the fish’s mouth easier, as the circle hooks are designed to not hook in the stomach of the fish but rather in the mouth, making extraction less dangerous for the fish.